This will be an abridged series based on my favourite anime of all time Puella Magi Madoka Magica. This project will be eventually split into twelve 7-10 minute episodes following the story of the series. If I don't have the right cast I will extend the deadline. I will also be in this series voicing Kyubey as I am a competent actor myself. This series will not be 100% comedic as other abridged series are as most of it will be comedic, it will still follow the main themes of grief. "After experiencing a bizarre dream, Madoka Kaname, a kind 14-year-old girl, encounters a magical creature named Kyubey. Madoka and her friend, Sayaka Miki, are offered the opportunity of gaining magical powers if they agree to make a contract with the strange little being. He will also grant them one wish, but in exchange, they shall risk their lives by accepting the responsibility of fighting witches. Invisible to human eyes, witches are catalysts of despair in the areas they inhabit. 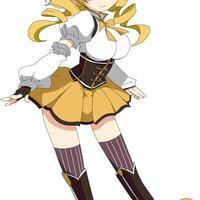 An ally of Kyubey, a magical girl named Mami Tomoe, befriends and encourages the two girls to accept the contract. 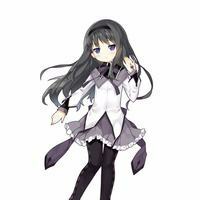 For an unknown reason, another magical girl named Homura Akemi is determined to prevent Madoka from accepting the deal." (Shocked and appalled) "Girls can't love girls! 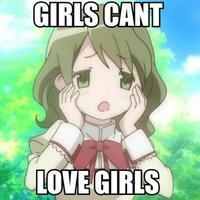 Girls can't love girls!" 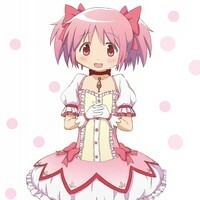 Madoka Kaname, the viewpoint and title character, is a gentle and friendly 14-year old girl. Living an ordinary life, Madoka has a loving family and is surrounded by good friends. One day she has a dream of a mysterious girl fighting an ominous creature. The next day, Homura Akemi, the girl from her dream, comes to her class as a transfer student. In this Abridged series Madoka will be presented in a very similar way to how she was in the original series, but she will be a lot more Gullible. (Try to say this in disbelief) "It is hard to imagine that out of all girls Kyubey would choose me"
(This line would be after Kyubey told you the truth about magical girls. You would want to say this line as you agree with him 100%) "You do bring up some good points"
Sayaka Miki is a main character and Madoka's best friend. Like Madoka, she is also a second-year student at Mitakihara Middle School. Tomboyish, confident, and a little brash, she upholds a strong sense of justice and adopts a heroic attitude as a magical girl. 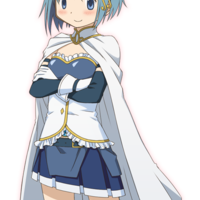 In this series Sayaka will realise her mistake much earlier in the series and she will be presented a lot more confident and cocky. (This will be said right after the first Madoka line. Say this line in a very arrogant way) "Well of course he would choose us, come on we are the two best girls in the city." (You sound like you realise you have made a mistake) "I was stupid so stupid."? (Say this while being happy) "Hey look at what I have done today. 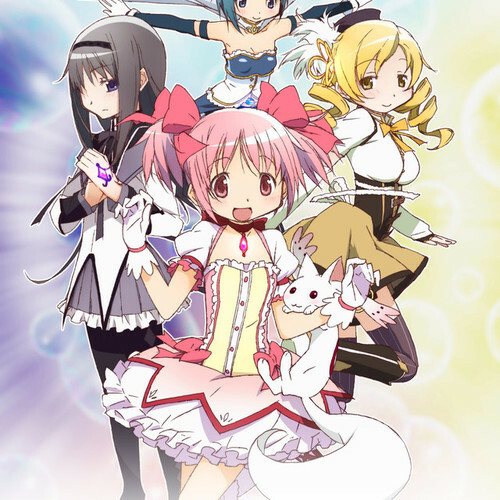 Made a contract with Kyubey AND saving you... What a day"
Mami Tomoe is a magical girl who rescues Madoka and Sayaka from a witch in episode 1. She is already contracted to Kyubey and offers to act as a mentor to the pair should they choose to become magical girls. She is a powerful veteran who fights with summoned muskets and ribbons, as well as a ladylike older sister figure who enjoys tea. Mami, eager to acquire new friends, demonstrates the glory and heady thrill of magical heroism, but also shows Madoka and Sayaka the terrible danger inherent in going into the teeth of a witch's domain. Mami will be portrayed as confidant, not cocky but confidant as she has been doing it for so long and that she knows her power. "I'm not afraid of anything anymore because I am not alone anymore"
"There is no other way. Either I kill you. Or we become witches and kill others"
(I want you to sound mysterious but also seem a bit desperate) "Remember this and take it to heart. Kindness sometimes leads to greater tragedy"
Kyoko Sakura is a veteran magical girl who appears to Sayaka and Madoka in episode 5, but not before making a brief appearance at the end of episode 4. She is introduced as an abrasive, fiery, and self-centered girl who fights only for self but later adopts a more sympathetic outlook. 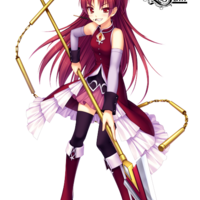 Kyoko in this series will be played off as a character that Homura is intentially using to get closer to Madoka. In the performance she will be a LOT more hotheaded and playful than she was in the original series. (Try to sound concerned for Madoka's well being) "Well you have no reason to become a magical girl like the rest of us, your life is fine and you have two loving parents."